M. and I last visited Bandelier National Monument in New Mexico in May 2011, mainly to see the new diorama in the visitor center that her brother had built. Then the Las Conchas fire closed in and threatened those buildings—but they survived (maybe with the help of copious Class A foam). The brother himself had never seen it, since he lives in Virginia, but we went there Wednesday as part of a family reunion. "They repainted my lizard," he said. "Crappy job." Apparently someone thought his yellow stripes were not bright enough. And the background mural had been cropped as well, although only he would have noticed that. One change was the effect of the September 2013 flooding, worst in the monument's history. (See pictures here and videos here). Lots more debris piles and fewer picnic tables — maybe those washed into the Rio Grande. 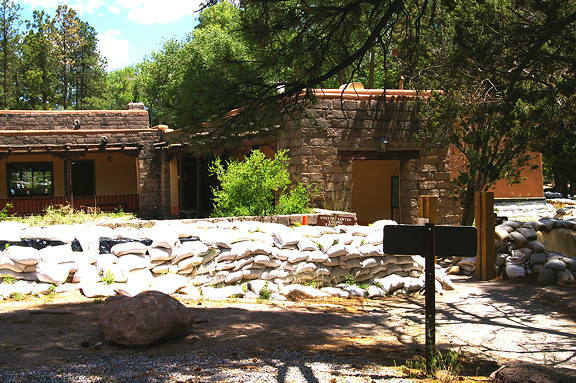 The visitor center is still sandbagged. Another is that visitors are now strongly encouraged to park in White Rock and take a free shuttle bus the last eight miles to the visitor center. Apparently this does not apply to those staying in the park campground and/or just driving to the Frey Trail head, judging by the number of cars there. (The bus also stops at the trail head.) There are a few other exceptions too—see the link. But after years of seeing the main parking lot fill up in the spring and summer and having to turn visitors away, the NPS has taken a new stance.